The Baha’i International Community works to protect the rights of persecuted Baha’i communities. In Iran, where the Faith continues to be viewed as heretical to Islam, Baha’is comprise the largest religious minority. 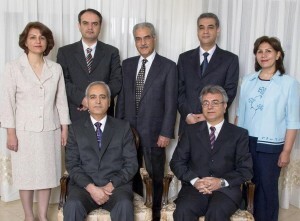 Since the Islamic Revolution of 1979, Baha’is have been systematically denied access to higher education, employment; and have been subjected to summary arrests and detentions. They have never been able to openly practice their religion. Our Office continues to work to defend the rights of Baha’is wherever their freedom to participate and to contribute fully to the life of society is denied. The cradle-to-grave attacks against Baha’is in Iran represent one of the broadest and most obvious cases of state-sponsored religious persecution in the world, said Heiner Bielefeldt, the UN Special Rapporteur on freedom of religion or belief. Speaking on 6 March 2013 in Geneva at a side event during the 22nd session of the Human Rights Council, Dr. Bielefeldt discussed the release of a new report by the Baha’i International Community, which documents rising violence against Iranian Baha’is and the utter impunity enjoyed by attackers. “It’s really one of the most obvious cases of state persecution,” he said, noting that the repression faced by Baha’is covers “all areas of state activity, from family law provisions to schooling, education, and security.” He asked participants at the side event – which drew some 50 representatives from governments, the UN, and non-governmental organizations – to visualize the impact such wide-ranging persecution has on an individual as he or she moves through the stages of life. “Imagine what that means for a child, in school, maybe even kindergarten, sometimes even in the preschool phase, of young life. To be exposed to the stigma, to be told there is something wrong with your family, that you have to change, you have to adapt,” said Dr. Bielefeldt. “Then, as the child gets to the age of higher education, now the problem is how to get access,” he continued. “We have lots of cases of Baha’is who have been expelled from universities and other sectors of higher education.” Then, he said, “imagine what it means if a person wants to get a position in life, to get a job. There is not the slightest possibility for a Baha’i to take a position in any public sector [job]. But even in the private sector, there is mobbing and stigmatization.” “How can a person start a family life, if in family law there is no official space for Baha’is to conclude valid marriages?” he asked, noting that this deficiency affects concerns ranging from inheritance to rights of custody. “There is an element of precariousness in all the important dimensions of human life,” he said. In the end, he added, there is “no denying that the treatment of the Baha’is is just a slap in the face, beyond anything imaginable, in the context of freedom of religion or belief. It is obvious. It doesn’t really require a subtle analysis.” And because the Iranian government has been only been minimally cooperative with UN mandate holders seeking to address human rights, “what we have to do – and continue to do – is to put pressure on the government.” “We have to bring it up again and again, in order not to let it happen that people get used to it,” he said. Its exceptional as your other posts : D, regards for posting .